Avengers: Infinity War will be one of the biggest films of 2018 — and that’s saying a lot after the unprecedented success of Black Panther, which collected an international box office of $1 billion inside of one month. This new Marvel project features superheroes such as Spider-Man, Iron Man, Thor, Captain America and, of course, Black Panther teaming up to take on a common enemy set to destroy the universe. But it’s a new day, and there are many more female characters beyond Black Widow to strike fear into enemies as male protagonists do. And Infinity War highlights the strength of Marvel Universe’s female characters — a battalion of badass women who fight alongside their male counterparts with a diversity of strength, intelligence and powers in a way never seen before, collectively, on screen. The Undefeated sat down with superstar Zoe Saldana — one of Hollywood’s most bankable, who was taking a break from shooting Avatar 2 — and British actor Letitia Wright, who was introduced to U.S. audiences as the Black Panther’s genius kid sister. Both women were featured in the video for Drake’s “Nice For What,” his recent record-breaking you-go-girl anthem. And after witnessing the might of their characters in Avengers: Infinity War, there is no doubt their power will grow tenfold. Your characters arrive on screen, and everyone in the theater will scream, “Yaaaas!” What does that mean to you? Saldana: It humbles me. It makes me feel superexcited to know that I am joining a band of women attracted to action-driven films. I love to see women portrayed in complex layers, where your physical abilities are also challenged. Wright: It’s something I always wanted to do with my work, with my talent. To be in that position where young women feel empowered, or encouraged, or inspired to be cool in their own skin, and do their thing, and contribute positively to the world — it feels really good. Obviously, you’re reprising roles in Infinity War, but take us back to the first time you suited up and stepped into your character’s shoes. 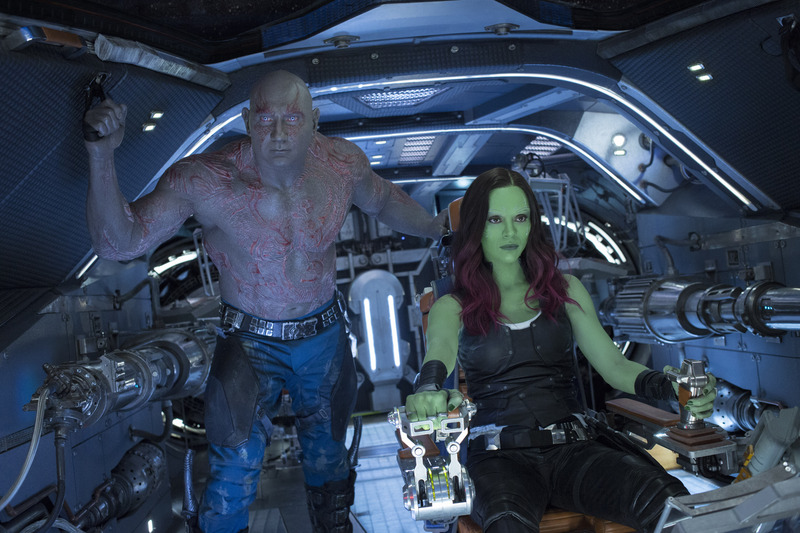 Saldana: I’m a Gemini, so I was very much a Gemini in the very first movie … becoming Gamora every single day. There was the real Zoe, the actress, the complainer: ‘This costume is itchy! The makeup really feels like it’s burning my skin!’ And then … as soon as I step into set and everybody’s in their character’s suit, that is completely left at the door and I become this excited little girl that feels grateful to be where I’m at, privileged to be collaborating with people that I feel like raise me every day — whether colleagues or my director or producers, or crew. Wright: The first time … it was kind of scary because it was a set filled with so many amazing actors and actresses. And I [hadn’t done] anything in the U.S., so I was kind of literally fresh off the boat — nobody knows who you are. And also just not wanting to let anybody down, and not fully understanding who she needed to be. I had my own perception of who she was … just super, superserious about everything. And [Black Panther director] Ryan Coogler saw my own personality, saw the light and the love that’s within me, and the fun vibes. And he wanted more of that for Shuri. It was difficult to put my perception of who she was aside … and then, as I went along, playing this character in the lab … and talking about superhard scientific things that I’d never thought about in real life … it allowed me to see that this character is empowering and that something different was about to happen. The representation of women of color in this film is amazing. Saldana: The fact that we are more than one in a cast. And that we are more than two. We’re actually like 10 … we feel we’re not alone. There’s a lot of celebration, just a lot of great energy, and I hope it continues. I hope other studios and executives … understand that they need to write complex and layered roles for women. … If audiences are always looking up to what we’re doing as a film industry, then we need to set the tone. Wright: I take my hat off to Marvel for stepping in and filling shoes that need to be filled in terms of producers and studios who are just doing things. Not just saying it, but doing it, to make change. And, yeah, it feels good that there are more women included in the films, even more so, collectively. And just to see that starting off with Zoe’s character, or Elizabeth’s [Olsen] character, or Scarlett [Johansson], you know? All the women in Guardians. It’s been happening for quite a while, and then to then have Black Panther bring in females of African descent, and a story of an African descent, it’s encouraging, and I’m just happy it’s happening. 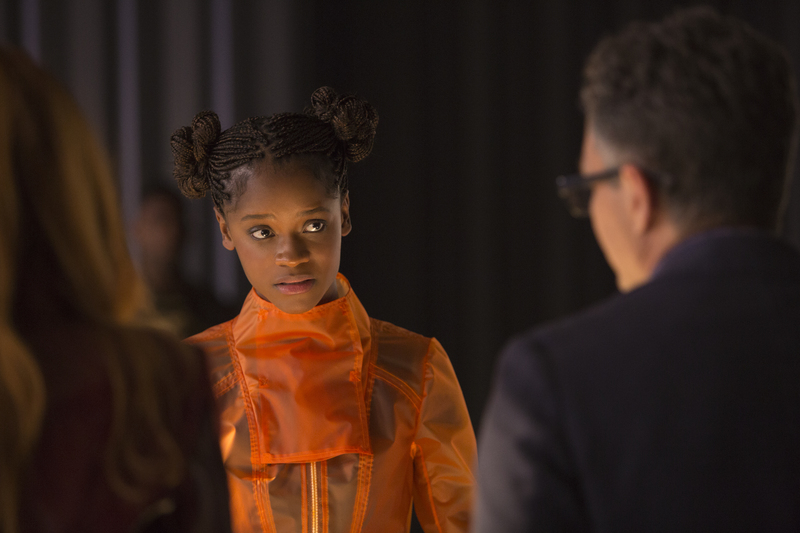 Marvel Studios’ AVENGERS: INFINITY WAR: Shuri (Letitia Wright) and Bruce Banner (Mark Ruffalo). When you were a little girl, which superhero or heroine did you pretend to be? Saldana: Ellen Ripley, Sarah Connor, ninjas! The Bionic Woman. Jackie Brown. Every time I would see a woman on screen or in my TV, regardless of the color of her skin, ’cause there was a time in my life when I was completely colorblind, and that was to me true bliss. And it was always in the comfort and in the safety of my home where my mother raised us to be colorblind. And still, to this day, she pursues that mission for us. Even when I’d go to school and the world began to taint my vision of what that was like, I still looked up to women regardless of the color of their skin. I held on to the fact that they were there to remind me that if they’re doing it, then I can as well. It’s important to instill in our girls that regardless of the color of your skin, we should always stand united. … In that unity we will propel change … through all of our subcultures and sub-issues and everything. If we keep it first as a general conversation, then once that’s out there, and we’re reminding people, and we’re not allowing people to forget, then we can also put our missions across as LGBTQIA women, as black women, as Jewish women, as Muslim women, as white women — we are all standing together. We need it. Wright: Man, this is hard. I looked up to a lot of people who were a part of the civil rights movement. I studied a lot of that when I was a kid, particularly the U.S. civil rights movement. Rosa Parks and, like, Martin Luther King and Malcolm X. These people who went out of their way to fight for something that they believed in and stand up for people who they believed in as well. I studied a lot about Rosa Parks … and how she just believed in something and believed in equality and believed in her rights and stood up for that. So those were the people that made an impact on my life. What would you tell your 10-year-old self? The one who didn’t see Gamora or Shuri or Okoye on a big screen? Zoe: That yes you can. That you can do anything you want to do, and that you are capable. If you have the ability, if you have the opportunity to lean in and have a role model in your life, just hold on to all of those people around you that tell you that you can do anything. And allow the strength of what they’re saying to you to be the strongest message that numbs out the noise of all the other people that are telling you that you can’t. Wright: Just saying to her to take in these superhero characters. Take in these women and learn from them. Try to find the positive aspects of what they represent. Learn from them and use them as steppingstones, to build confidence. If there’s a character such as Okoye in the world, or a Shuri in the world or a Black Widow in the world, that’s an amazing thing, you know? I would say to my 10-year-old self if they can do it, you can too. What other character in this film inspires you? Saldana: Chadwick’s [Boseman] T’Challa inspired me and made me cry, because to be able to see a man of color be so sensitive, and be so human and be so delicate, really moved me. Because before that, every time I would see a man of color on screen, the emotions that were always highlighted in that man were emotions of anger and rage and injustice. And there are so many other layers to a man, regardless of the color of his skin. Wright: I’ll definitely say Black Panther. Not to be biased, because he’s my character’s brother, but because he has such a difficult task. It educates me on how to be a leader. Seeing a leader who’s not afraid to take the opinions of other people, especially women, on board. And not think, like, ‘Oh, man! Don’t need a woman’s help!’ No, he’s so receptive, and so open to both genders, no matter what status you are. He even takes advice from his little sister.